Kids, Cows and Grass: Calving season is here--you are not going to believe what else is in my pasture! 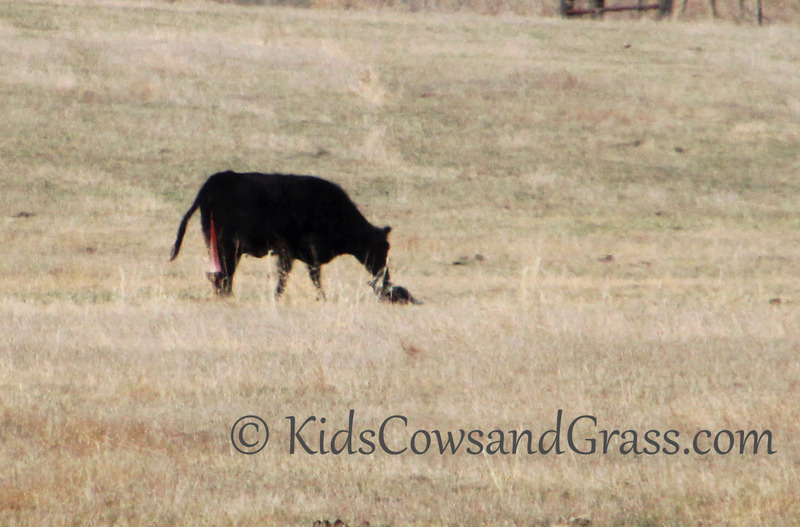 Calving season is here--you are not going to believe what else is in my pasture! Take a look at this pictures...what is the first thing you notice? As a rancher, I notice the cow on the left has just moments ago had a calf and is trailing the afterbirth and licking her brand new, slimy baby calf. What is the next thing you see? 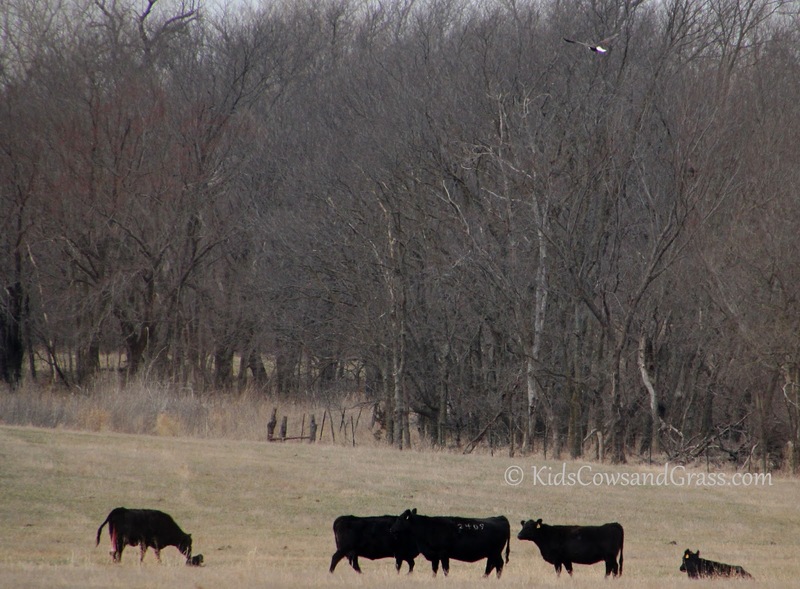 Look up at the top right corner and notice the bald eagle soaring above the cows. 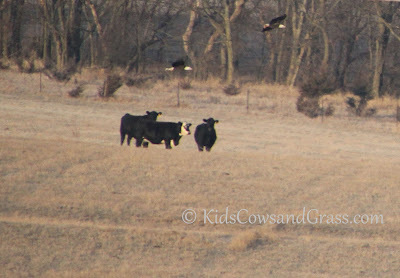 Wait, did I say a BALD EAGLE is in my calving pasture?! YES I did!! Actually yesterday, there were two eagles flying low over the cowherd. This calving pasture is just about 200 yards from my front door and I can look out the window to check for new calves. Yesterday I noticed the cows were a bit agitated and interested in something on the ground. I could see white flashes and movement, and about 20 cows started running at the objects when they took off flying with the cattle chasing them, their noses in the air, watching the eagles! I wish I had my camera at that moment. But my description of that scene will have to suffice. And the photos I do have are quite grainy as the eagles are quite a ways off, but I couldn't pass up sharing them with you! I have been told that the eagles come from the Tuttle Creek Lake, approximately 45 miles from us, where they have nests. This time of year, they are looking for nutrition and I guess cow's afterbirth is wonderful nutrition! Seriously, it is high in iron and other nutrients. Usually a cow will eat her own placenta. I don't know the scientific explanation for that, other than it is good nutrition and it also protects the calf from predators that may find the afterbirth and come looking for a newborn calf. Often, the cow becomes distracted and will leave the site where she gave birth and the placenta will be left behind. Can you see the two eagles in the picture at left on the ground together? Later, a few crows joined the eagles, but they kept their distance. If you are interested in more information about eagles, check out the Decorah eagle cam alerts! They have set up a webcam on an eagle's nest and can watch as eggs are laid and later hatch! What a wonderful learning tool. So as I marvel at Mother Nature and the beauty of the eagles, I hope to never become tired of the view of a newborn calf and his mama. Nature at its finest! A Baby is Born: photos of the birth of a calf--up close! Visitors witness a big surprise--the birth of a calf! : what a perfect way to end a visit! 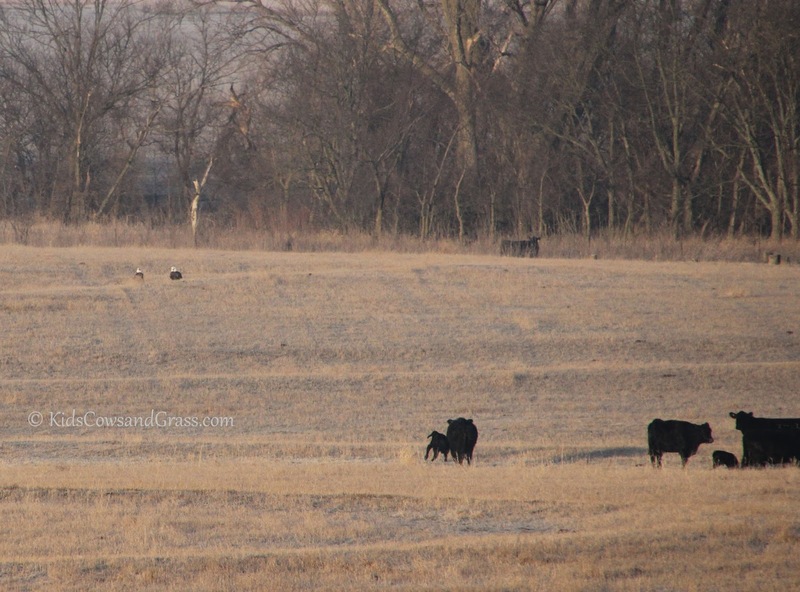 Wordless Wednesday: Baby Calves are Here! And you can find even more information about newborn calves by searching my blog for the words "Baby Calves" or "newborn calves." Have you run by in the morning, Jeff? They are waaaay better in person! Those are some big, beautiful birds! Powerful, awesome, fearsome and beautiful. I do understand why they are an American symbol! 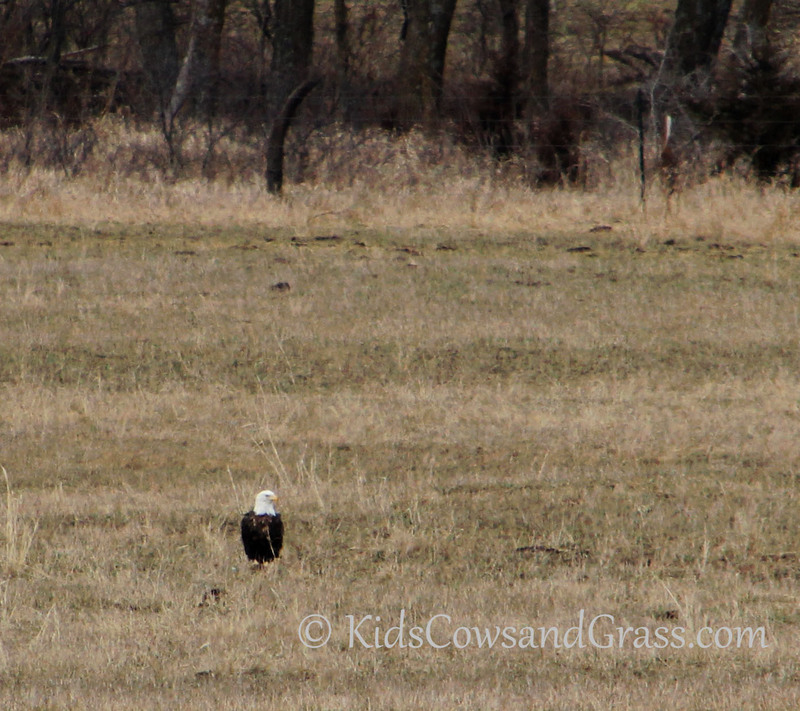 I always love seeing bald eagles in our neck of the woods. However, last year a young eagle killed a newborn lamb in front of our eyes - just flew down and stuck its talons through the skull. It was heartbreaking, breathtaking , awesome and awful all at once. Wow Elaine, Nature is all of those things. So sorry to hear of the brutal loss of the lamb. I love living on a farm. Our big predators are owls. We raise Game birds. We are always on the lookout! Snakes can be our worst nightmares too! I also sell Real Estate in my small rural town. I just launched my new website www.ranchandfarmlands.com and would love to invite you to stop by for a visit. I am starting a new blog this week. Anyone looking for a farm or ranch for sale can find it on my new site and get great info on farm life on my blog! Thanks for the great article!